Beautiful Rosary or Trinket Boxes! 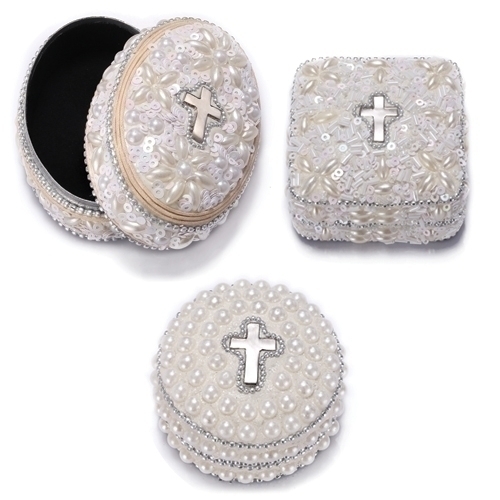 Each box is embellished with lace, faux pearls, sequins and features a cross in the center of each lid. Box is made of Stone/Resin Mix. Boxes are approx. 3 inches. These are perfect for holding a rosary, ring or piece of jewelry. Makes a perfect gift or gift box for First Communion, Confirmation or any occasion! These are really lovely! Comes in oval, round or square shape. Please message me or indicate when ordering which shape you would prefer.